This section providing information on handling Chinese character string literals in GB18030 encoding. header() function must be called to override the HTTP response header 'Content-type' setting to GB18030 in PHP 7. 1. Open the PHP script file, String-GB18030.php, again with a different text editor. No issue found in those Chinese characters. I think I know the root cause of the issue. PHP-CGI.exe in PHP 7 engine automatically added "charset=UTF-8" in the Content-Type HTTP response header line. And the Web browser takes the encoding setting from HTTP response header instead of from the HTML document header. #- Copyright (c) 2005-2019 HerongYang.com, All Rights Reserved. Now copy String-GB18030-Fixed.php to \local\apache\htdocs. 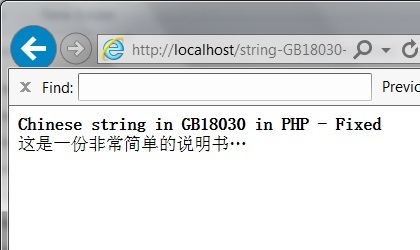 This proves that the editor: notepad, the CGI program: PHP CGI, the Web server: Apache, and the Web browser: IE, all worked correctly with Chinese characters in GB18030 encoding.